After discussing the principles of sloyd in my first article, we looked at how to begin paper sloyd in Forms 1b and 1a. My previous article ended with this quote from Mr. Devonshire: “It should be clearly understood that it is Card-board Sloyd that is considered essential for the full development of the child…” In this article, we will look at the specific benefits that come from a progressive course of sloyd, and then we will conclude with the “how-to” of cardboard sloyd in Forms 2 through 4. For the sake of simplicity we will follow and expand on the benefits laid out by Miss Pennethorne in her article “Cardboard Sloyd” (1906). She gives three categories of benefits that result if sloyd is used to “its fullest educational value”: physical, mental and moral. We will look at them one by one. 1. It trains the eye to accuracy (accuracy being understood as absolute, not relative) in (a) drawing a straight line, (b) measuring distances and angles, (c) cutting on the line drawn. 2. It trains the hand to follow the guidance of the eye, and to obey exactly the impulse of the motor nerves transmitting the message of what the hand is required to do. It may be said that a perfect system of handicrafts tends to increase and refine on individual lines the powers of mind and body already developed by a perfect system of gymnastics. That same intentional movement increases the student’s powers in drawing specifically so that he might make accurate representations of what he sees. This power is what brings us to the second category of benefits. So not only does the practice of sloyd develop the ability to think rightly and control the use of our hands, but it also aids in the use of the imagination. The student will learn to imagine a three-dimensional object from a two-dimensional diagram and then learn to draw a two-dimensional diagram from a three-dimensional model. By combining reasoning abilities, imagination, and mental control with manual dexterity, the student will grow in his ability to make and do what is necessary. The student can also take these mental powers into other areas of his schooling. His reasoning powers and measuring skills apply to math. He becomes better at nature journaling because of his increased ability to make his hand draw what his eye sees. He takes pride in his Book of Centuries because he can accurately reproduce artifacts of interest on his page. He has an understanding of the foundation of architecture and the confidence that comes from accomplishments made by his own power. Mr. Devonshire calls that confidence “moral progress,” (1905, p. 9) which bring us to the final benefit we can expect from diligent lessons in sloyd. You will be giving them a fuller understanding, and therefore a fuller pleasure in some of the commoner everyday things of life, and in the underlying principles of innumerable human productions; but, above all—and sometimes, when I look about me, I think that this gain alone should suffice to give Slöjd an honourable place in our schools—you will, if your methods are sound, and your own heart is right, give them respect and love for all honest hand-work and honest hand-workers, and so save them from that blight of shame which still fastens on many and many a human being at the thought of doing any honest work whatever, and on still more perhaps at the thought of working with their hands! Craftsmanship has long been stigmatized and it is simply wrong to perpetuate this idea that educated people don’t get their hands dirty. There is dignity in every dirty job and every kind of rough work. It may be that the child’s best way to serve is in some honest handwork. If you still had any doubts about the importance of continuing sloyd, I hope I have finally dispelled them. And so now we move on to the “how-to” for cardboard sloyd. 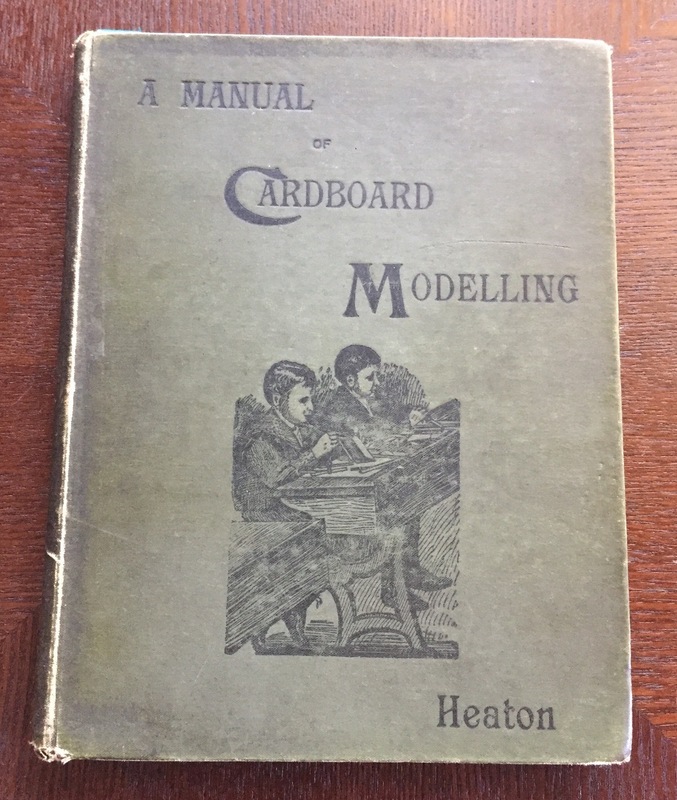 So to understand cardboard sloyd at it’s best, we need to use Heaton’s A Manual of Cardboard Modelling as our guide. In Form 2, handicrafts move from morning lessons to afternoon occupations. By this time the student should already have control over his knife and skill in accurately measuring and cutting, but these lessons are still not handed over to the child without adult supervision and oversight. In the quote above from Mrs. Steinthal, we see that she recommends that the teacher study the book herself and learn how to do the models, then teach the students. If the student has a solid foundation in paper sloyd, and the teacher has taken the time to ensure that the new skills are understood, then the student will soon be ready to do models completely on his own; the teacher will only need to be on hand for questions and difficulties. Transitioning to the metric system for increased accuracy when increasing or decreasing the size of the model. Using thicker paper and learning the appropriate amount of pressure to score it without cutting through. How to bind edges with bookbinding tape. So while the initial models seem quite simple, students are building up the skills which will allow them to be successful with the more complicated models. Forms 3 and 4 continue along the same lines as Form 2, but doing six models per term. Models increase in difficulty because of the more complicated geometric shapes used in the diagrams. We do not know if sloyd was done in each term. If it was, models from Heaton’s book would be exhausted by the second year of Form 3, but we can see it scheduled in Form 4 as well. Because of that, I think it is likely that sloyd was not scheduled every single term in Forms 3 and 4. 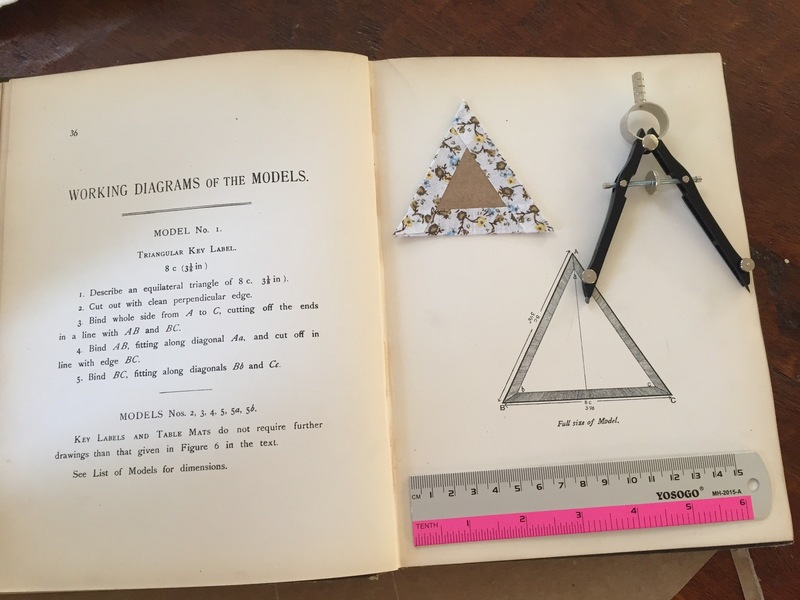 The last skill to be mastered in cardboard sloyd, before moving on to wood sloyd or bookbinding, was the ability to draw a diagram from a geometric model: converting a three-dimensional object to a two-dimensional drawing. Plans for these models, to be made by the teacher, are included in the appendix of William Heaton’s book. The “cardboard” used for cardboard sloyd is simply thick cardstock. A variety of thicknesses can be used, including thin chipboard, like the type used for retail gift boxes. Thicker than that is not recommended. Our preferred cardstock is 110 lb (300 g/m2); it is readily available in craft stores and comes in a variety of different colors. The same craft knife used in Form 1 can be used for cardboard, but if wood sloyd is the goal for that student, it may be worth purchasing an actual sloyd knife and learning how to sharpen and care for the knife. I remind the reader that both types of knives are quite sharp and, while I do allow my own children in Forms 1 and 2 to wield them, I always ensure that the knives are kept out of reach when lessons are over. For binding we have many more options than the students would have had a hundred years ago. In addition to bookbinding tape (which didn’t always come “pre-gummed” at that time) we have washi tape, in many patterns and widths, as well as colorful duct tape and masking tape. I think it is perfectly fine to take some liberties here with choice in materials. Bookbinding tape can be quite expensive, especially if it has to be shipped to the home. The other kinds of tape are much less expensive and are readily available at most craft stores. At this time William Heaton’s book is not readily available, but I do hope to bring it to the Charlotte Mason community soon. Until then, I recommend that you go back through the later models in the Rich book and practice some cutting with a knife. Unfortunately there is no other title I can recommend for teaching cardboard sloyd. And works like hang! dash! blow! Devonshire, J. (1905). Harmonious relations between physical training & handicrafts. In L’Umile Pianta, March, 1905 (pp. 8-11). London: Parents’ National Educational Union. Heaton, W. (1894). A manual of cardboard modelling. London: O. Newmann & Co.
NLT. (2013). Holy Bible: New living translation. Carol Stream, IL: Tyndale House Publishers. Pennethorne, R. (1906). Cardboard sloyd. In L’Umile Pianta, April, 1906 (pp. 3-6). London: Parents’ National Educational Union. Russell, C. (1893). On some aspects of slöjd. In The Parents’ Review, volume 4 (pp. 321-333). London: Parents’ National Educational Union. Steinthal (1894). Aunt Mai’s budget. In The Parents’ Review, volume 4 (pp. 922-931). London: Parents’ National Educational Union. Steinthal (1897). The value of art training & manual work. In The Parents’ Review, volume 8 (pp. 414-418). London: Parents’ National Educational Union. Fascinating article – as usual. Thank you Brittney! I was especially intrigued with the “moral” section. Thank you for reading and commenting, Lisa. I think the idea of the moral benefits in Russell’s article is what first got me hooked! Thank you, Brittney, for equipping me for sloyd lessons as I head into the new school year with my older students. One can only imagine my boys’ glee at each finding a new Morakniv along with the usual new notebooks and pencils on their first day. Your reprint of “A Manual of Cardboard Modelling” will be most eagerly awaited and your inclusion of moral habits had me “all ears” as I particularly love that intersection of the practical with the profound in a CM education. I’m most likely late to this party but I’ve finally put two and two together to realize the preface to Heaton’s book by T.G. Rooper is none other than the beloved House of Education inspector and PNEU proponent, Mr. Rooper(!) who had attended sloyd classes at Naas himself. The final chapter of Mason’s “Formation of Character” is a tribute to that modern educator in which she tells us, “He delighted to turn out a perfect wooden spoon on his Sloyd bench, and was most keen to learn leather work by watching the students at the House of Education” (p. 424). Thank you again for sharing your research with us. I hope your boys are not the only ones delighted to find a shiny new blade among their back to school supplies. I was also intrigued to find that the Mr. Rooper who wrote the preface to Heaton’s book was the same Mr. Rooper known personally by Miss Mason! When examining the relations between these progressive leaders in education, the connections are remarkably close. Fascinating! Thank you for sharing this exciting connection with our readers. Thank you for this series! I’m really enjoying our initial sloyd lessons (my son is in 1B). I’m wondering: Is the paper you recommended here (110 lb) also what you would recommend for beginners just working with paper folding? We took your advice and have started with 6×6 in. pre-made squares of paper. These are origami papers that I ordered. They are easy to fold but I have been wondering if they are flimsier than the “real stuff” should be? Thanks in advance! I am so glad you have enjoyed the series and your lessons thus far in paper folding. I understand what you mean about the paper being flimsy, but I recommend that you stick with it, at least until the skill of neat and accurate folding is well in place. You can go to slightly thicker paper with about the feel of printer paper, but I don’t recommend cardstock until you are ready for paper sloyd. The 110lb paper is too thick even for paper sloyd. It requires scoring to fold well, so it would be a poor choice when folding is the skill to be worked on. I think of the origami models of being more fun, but less serviceable. I hope that helps! This is a wonderful article which, of course, made me want to track down A Manual of Cardboard Modelling! Am I correct in understanding it is not currently available anywhere? Thank you so much for all the work you are doing! I am so glad you are excited about cardboard modelling! But yes, Heaton’s book is currently unavailable. I am working with Living Library Press to get it republished, but I don’t have a time frame yet. We will share it on CMP as soon as we get a date! Do you have a favourite knife for younger students? Thanks!